Minnesota Personalized Medicine is located in the Loring Medical Building on the east side of Loring Park in downtown Minneapolis. Loring Park is a beautiful retreat just east of the Walker Art Center’s Sculpture Garden. Other landmarks near the clinic include the Basilica of St. Mary, St. Mark’s Episcopal Church, and Hennepin Avenue United Methodist Church. We offer FREE parking to all of our patients for the duration of their appointment available in two parking lots which are adjacent to our building. Please see the map above for details. 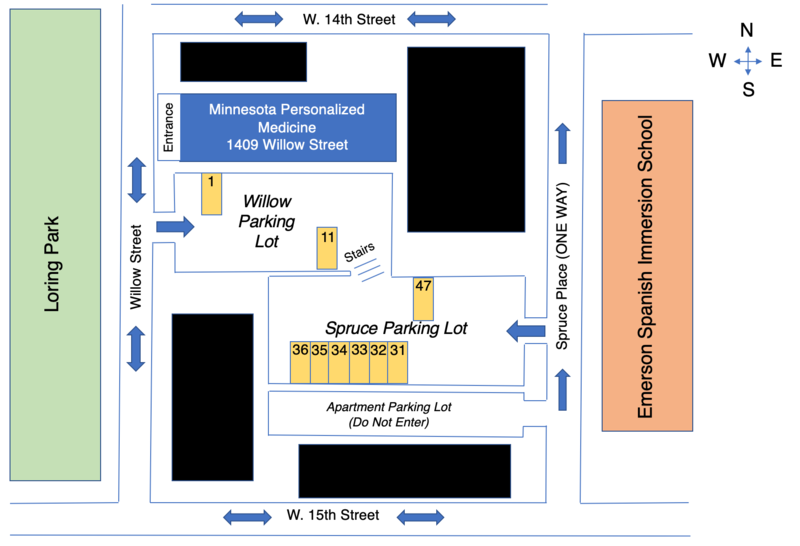 Our Willow Parking Lot is accessible from Willow Street, adjoining our building entrance. Here, we have guaranteed parking in spaces #1 and #11. Our building also has a designated handicapped parking (available to all building guests) next to space #1. Our Spruce Parking Lot is accessible only from Spruce Place, a one-way street running south to north after turning from W. 15th Street. The lot entrance is the second driveway on the left across the street from the Emerson Spanish Immersion School. Here, we offer parking in spaces #31-36 and #47. Free, two-hour parking and meters are also available along Willow Street and W. 15th Street. Many areas of Minneapolis will be undergoing construction during 2019. Please check for the latest updates HERE or call us at 612.345.5029 for more information. We want to ensure that your journey to our clinic is as smooth as possible. 94 south to the Hennepin-Lyndale exit. Pass the first stoplight (Dunwoody Boulevard) and turn left at the second stoplight (before the Walker Art Center) onto Oak Grove. When the road splits, bear left along the park on W. 15th Street. If you are parking in space #1 or #11, turn left at the first stoplight onto Willow Street and right into the Willow Parking Lot for the Loring Medical Building. If you are parking in spaces #31-36 or #47, continue one block past Willow Street to Spruce Place and turn left. The entrance to the Spruce Parking Lot is the second driveway on your left. Take 35W North to the 94 West exit. Keep in the right-hand lane and exit at Hennepin Ave. N. At the stoplight, turn right and head north toward the Walker Art Center. Keep in the right-hand lane, pass the Hennepin Avenue United Methodist Church and turn right at St. Mark’s Cathedral onto Oak Grove Street. Bear left along the park on W. 15th Street. If you are parking in space #1 or #11, turn left at the first stoplight onto Willow Street and right into the Willow Parking Lot for the Loring Medical Building. Take 94 West to the Hennepin Ave. N. exit. Keep in the right-hand lane and bear right. At the stoplight, turn right and head north toward the Walker Art Center. Keep in the right-hand lane, pass the Hennepin Avenue United Methodist Church and turn right at St. Mark’s Cathedral onto Oak Grove Street. Bear left along the park on W. 15th Street. If you are parking in space #1 or #11, turn left at the first stoplight onto Willow Street and right into the Willow Parking Lot for the Loring Medical Building. Take 394 East to the Dunwoody Blvd. exit. Take Dunwoody Blvd. to the first stoplight. Turn right and weave around Parade Stadium. At the first stop sign, turn left onto Kenwood Pkwy. and head toward the Sculpture Garden and the Walker Art Center. Proceed through the stoplight at Hennepin-Lyndale in front of the Walker Art Center. When the road splits, bear left along the park on W. 15th Street. If you are parking in space #1 or #11, turn left at the first stoplight onto Willow Street and right into the Willow Parking Lot for the Loring Medical Building. If you are parking spaces #31-36 or #47, continue one block past Willow Street to Spruce Place and turn left. The entrance to the Spruce Parking Lot is the second driveway on your left.